These stylish loft bedroom ideas can help you find the perfect design for your own bedroom space. Decorating and planning the furniture layout of loft bedrooms can be a challenge due to their unique layouts. Below you find creative ways interior designers and homeowners are creating exciting loft bedroom designs and get inspiration for creating a room you’ll love. In the picture above, exposed beams, pipes, brick walls and hardwood floors gives this loft its rustic character and style. A hand-woven silk carpet helps define the sleeping area. Large glass windows help lighten the feel of the space and lets enough sun shine in the room. By adding a mirror, it enhances the reflection of light all throughout the room. For privacy, screened windows and wooden blinds are incorporated. A solid wood window frame, reclaimed wooden headboard and a tree stump creates a focal point for this loft. Transforming and decorating a small space such as the loft can be challenging, but it can actually be fun. A loft bedroom has a wide-range of design opportunities to showcase with its immense architectural formation, composition and open space. Such qualities make these loft unique, interesting and fascinating; but, it can also create certain design challenges. No worries, here is where we could be of assistance; by sharing some design solutions and ideas on how to address common designing issues you may have. 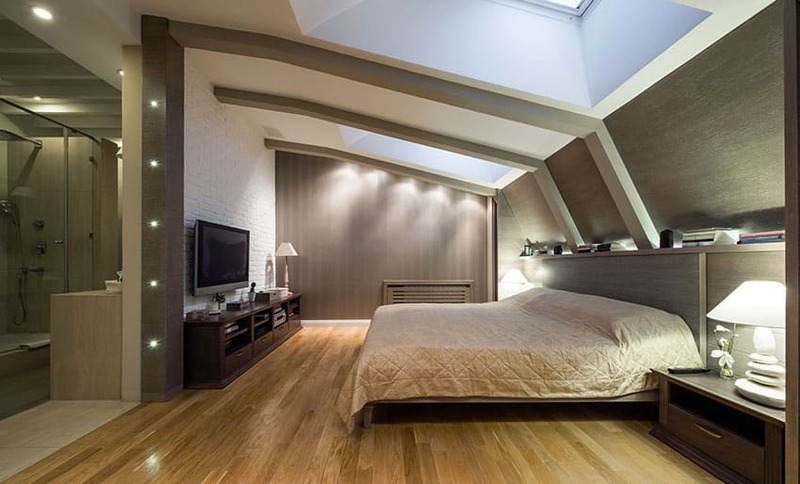 Most homeowners are taken aback with small spaces or that of how to define the loft space to function as another extra room, or how to establish the loft as part of the home. The first step is to assess the loft’s suitability to be converted into an additional room. Next is to determine the existing head height; the usable part should be greater than 7 feet. Then, define the pitch angle; if you have a high pitch angle, most likely you will need a higher head height. After which, verify the type of roof structure; either the roof uses a traditional framed type, which has more structural framework or a truss section type which are factory-made and requires a greater structural input. Next is defining the space, you can start by designing a simple platform by making use of patterned flooring either by incorporating different materials such as tiles, laminated or hardwood floors. You may also use an area rug or carpets to establish a particular space. Adding walls can also help define different functional spaces, such as installing screens or by hanging panels or fabrics. Carpets, rugs, fabrics can even help achieve sound-control in lofts where sound can bounce like a ping-pong ball. Storage space is very important to have in any room and the loft is no exception. Yet, most of the time a closet space is what a loft seem to have no place for despite all that big open space. The solution is simple, create something that is functional and at the same time still adds a certain design advantage and character to the room. Installing shelves to hang clothes and stack linens, fabricating storage blocks to hide those clutters and at the same time function as a piece of furniture. Speaking of furniture, choose those with storage function such as platform beds, buffet cabinets, chest of drawers or custom made furniture that doubles as storage and at the same time can be a focal point in the room. By clearing out the clutter, you create a sense of a larger space and a more relaxing retreat. Another important thing to keep in mind is the scale or size of the furnishings; make sure that it match the capacity of the space in your loft. Always take in consideration the ceiling height. Don’t be afraid to use large pieces of furniture or artworks for dramatic effect. Keep in mind that the scale and lines are very important. Make use of original building materials which are already found existing such as brick walls, hardwood or concrete floors and even exposed duct work or beams. One more very important thing to consider in creating a beautiful loft is the type of windows you would prefer to install. Roof lights, dormer windows, skylights or even a balcony window are just some ideas and choices available to you. Don’t be afraid to let the light in, it will open up your bedroom and will make the space appear larger. If there’s a deficiency in natural light, you can always install recessed lighting, wall or hanging lamps. Always take into account a controlled ventilation in order to maintain good air quality. Many interior designers recommend loft bedroom ideas that go for a calm and soothing color palette. Neutrals are now edging their way back into the trend of color charts. Finding the right shade can blend well together and work beautifully, thus creating a cozy and inviting ambience. It can also even make the smallest spaces feel comfortable, bright and lively. We hope that our collection of photos will give you a more in depth ideas to achieve a gorgeous loft. Take advantage of the design concepts below and remember that there is no limit to your imagination and expressing your unique style. This cozy cabin log loft made use of knee-high wall partition, installing a wall to wall carpet and a door creates and defines a separate sleeping area for privacy. A balcony window allows a view to a breath-taking landscape and let ample amount of natural light to shine throughout the day. High ceiling lets the air to circulate better. This is the best and most beautiful solution which keeps the loft from being just a storage space. Bare concrete ceiling with exposed duct works features an industrial design scheme. The solid hardwood flooring makes the room feel more cozy and warm. Area rugs are being used to define different areas such as the sleeping area and the study/office area. No need for too much artworks on the wall since these large picture windows and balcony allows the beautiful scenery outside to add finishing touches to this contemporary loft. These large panel windows which are more popularly known as skylights are one of the basic loft window conversion. These types of windows are easily fitted to the existing roof and doesn’t require too much structural modification. 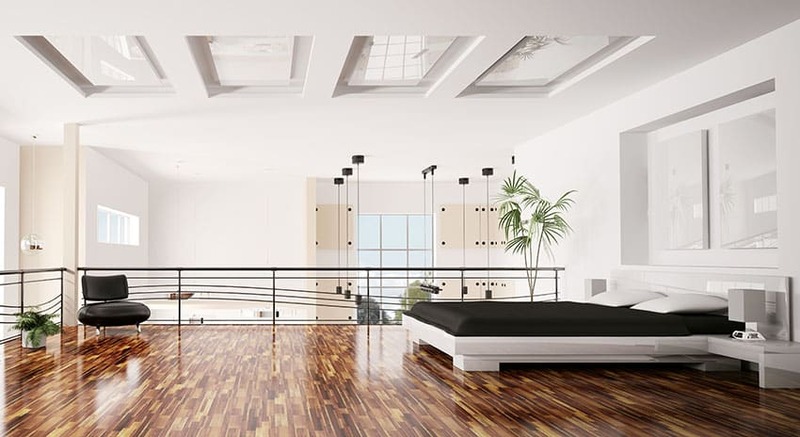 Patterned wooden flooring in light tone finish gives this room a warm and cozy feel. 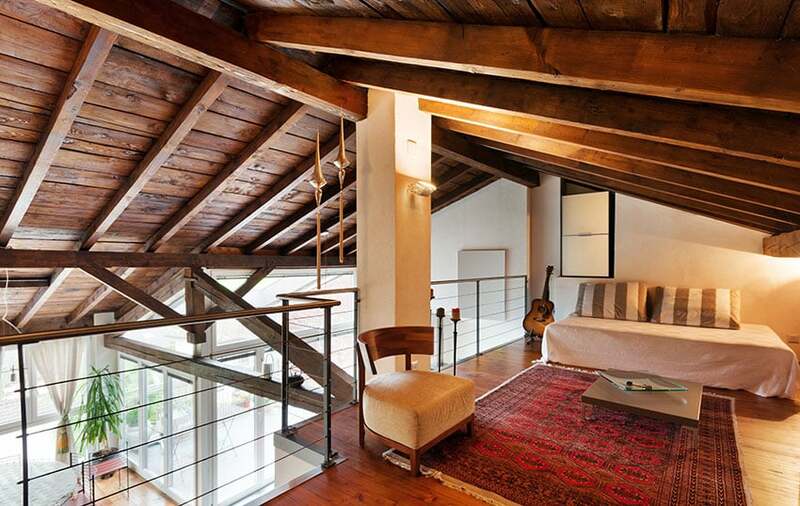 Again, an area rug defines the sitting area for this spacious loft. The rustic wall finish blends well with the worn old look finish of the furniture creating a countryside design scheme. 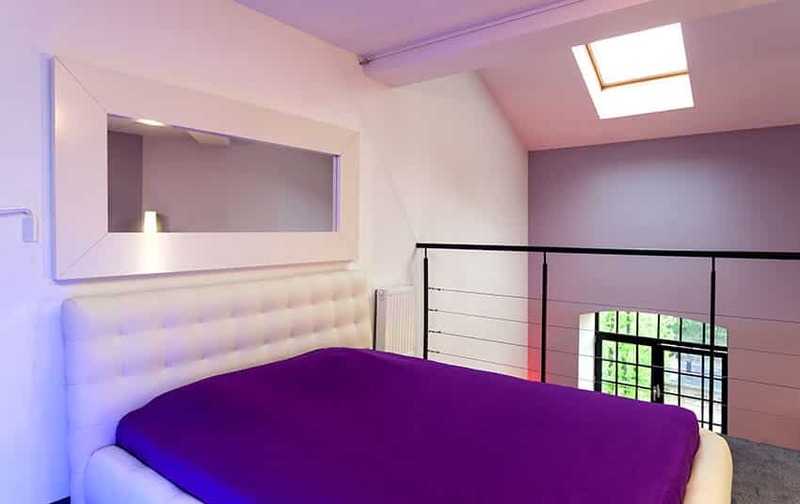 This loft was converted into a fabulous modern teenage bedroom retreat. The bed doubles as a seating area for friends when they come and hang out. There is also available storage under the bed for clothing. Modular steel shelves give extra storage without compromising the design scheme. The accent wall and accessories adds character to this teen bedroom loft. This contemporary bedroom with a reverse floor plan, as term goes has the bedroom in the main area below while the loft has the sitting and closet area. Wooden planks in medium tone finish are seen incorporated on the flooring and ceiling. This bedroom layout is so relaxed and made good use of the ceiling height. Here’s another contemporary style loft bedroom has a living area upstairs; incorporating once again a reverse floor plan design. This is perfect for entertaining guests and at the same time providing a more private retreat. The design layout and planning enabled the owners to maximize the space to its fullest potential and great functionality. This Mediterranean style inspired loft is converted to a guest bedroom. The design features a wrought iron staircase railing, the wooden furniture are scaled to the size of the room which are typical of the Mediterranean design scheme. Classic neutral colors are used depicting the Mediterranean landscape, creating a warm and relaxing feeling. Upstairs is another area where best to unwind especially if you are a book lover or just simply enjoy a cup of tea or coffee. 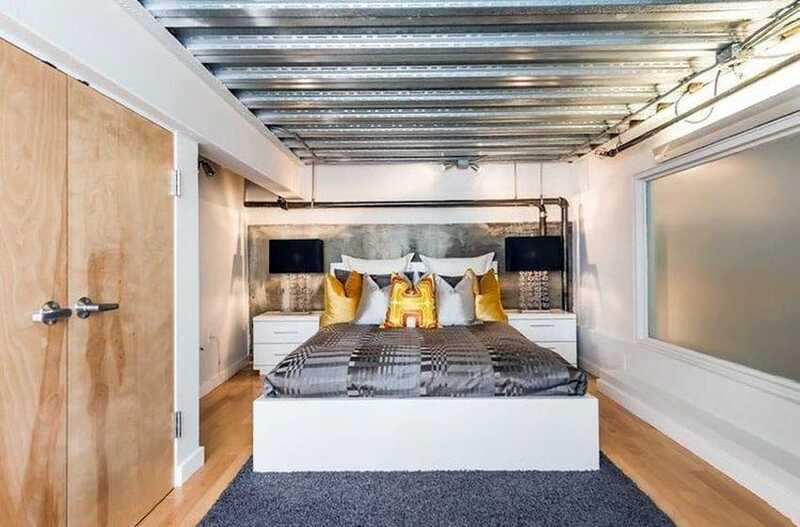 This modern style bedroom loft incorporates steel decking for the ceiling, custom made steel headboard and exposed duct works. Light wood laminated flooring, area rug and natural stain wooden door offsets the coldness of steel and gives this room a warm and cozy ambiance. Neutral color scheme, minimal accessories and enough storage space makes the room seems larger, comfortable and clutter free. 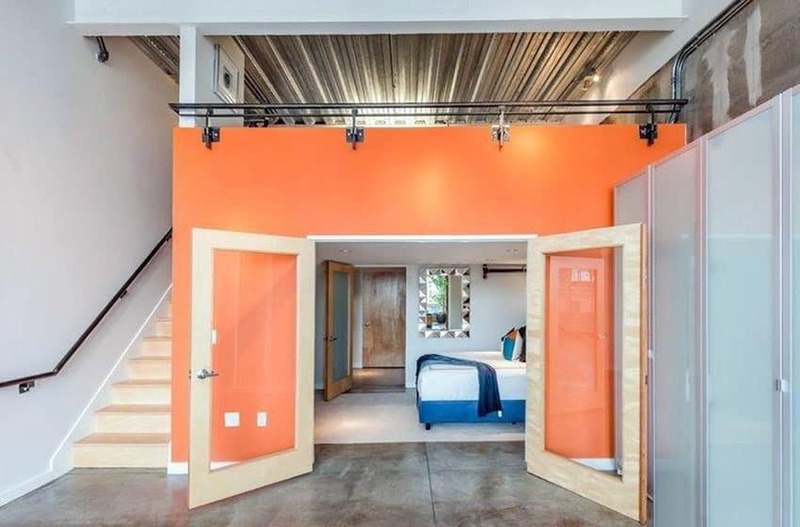 This loft guest bedroom is tucked away from the main living room by incorporating a framed double glass doors. The concrete flooring which extends from the main living area all the way to the bedroom is compensated by installing a wall to wall carpet. See more living room bedroom combination ideas here. This romantic bedroom design with a rustic brick wall, meets a soft and dainty four-post bed with canopy. Amidst the unsophisticated brickwork and exposed solid wood beam, is a delicate sleeping area where dreams do come true. Mix and match materials such as wooden floors balanced by a shaggy area rug turns this loft into a comfortable and inviting rustic style haven. Large picture window allows natural light to fill in and adds more drama to this loft. 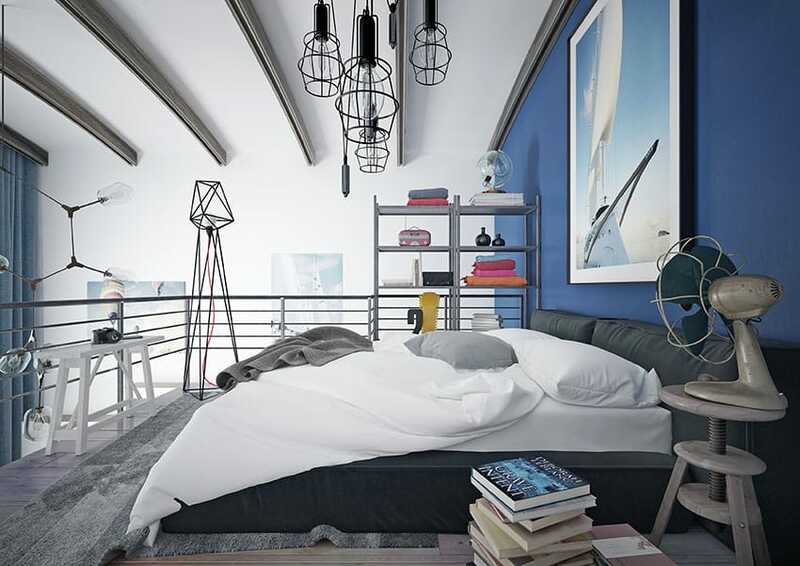 This modern bedroom loft features a minimalist style. The classic white walls and coffered white ceiling is balanced out by the dark tone wooden flooring and black upholstery and bed linens. The furniture are proportioned to the height of the steel railing. 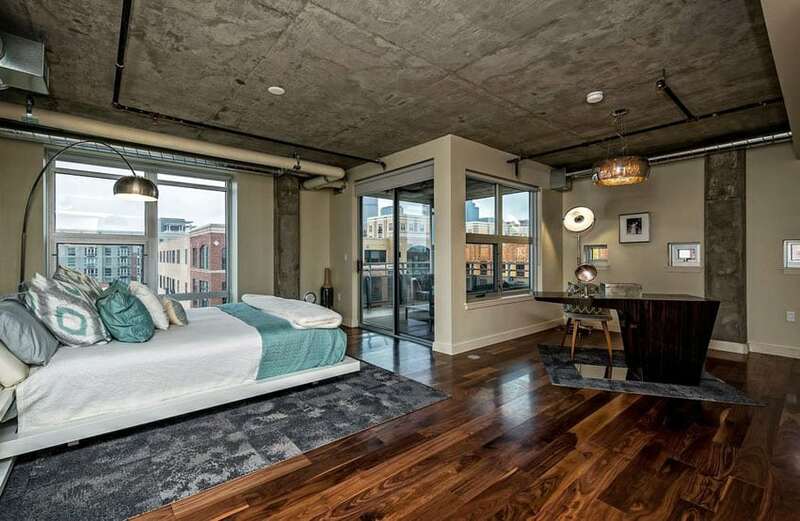 This stylish loft is transformed into an open master bedroom suite overlooking the main living room below. An elegant modern loft style bedroom features a great splash of color with purple and white tufted bed which balances the adjacent accent wall. 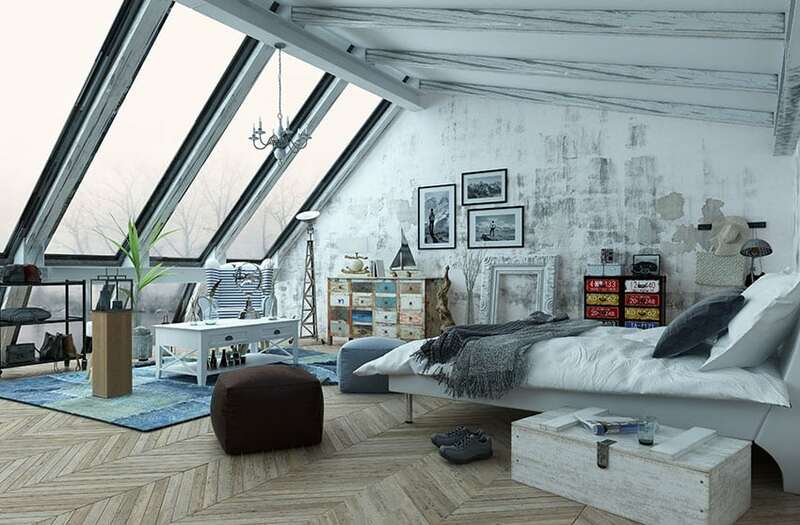 Loft bedroom ideas with skylights will help add needed light. For this room a skylight window allows you to stargaze before you doze off to sleep. 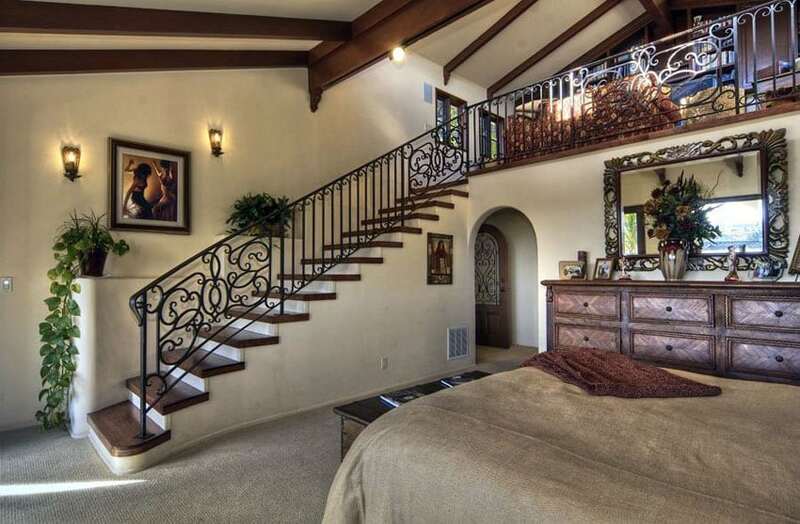 This trendy bedroom loft is open to the living room below. The mirror reflects on the natural light, making the room brighter and feel bigger. Trendy make-over transformed this loft upstairs into an open guest bedroom and music suite that overlook out to the main living and to the patio outside. The panel glass doors and window below let in more natural light extending to the loft upstairs. The wood beam vaulted ceiling is an awesome feature to this design scheme. Indirect soft lighting is the only light needed for this space which helps pull down the ceiling height a little bit. An area carpet defines a separate space and adds coziness and warmth. Visit this page for more ways to turn a living room into a bedroom. 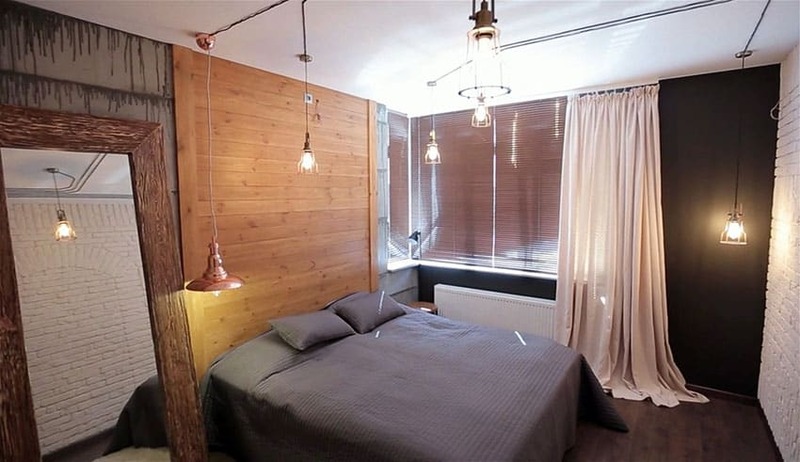 By integrating wide medium tone plank wood floors and exposed solid wood beams to this trendy bedroom loft, creates warmth and balance to the wall of windows. Adjacent to the wall of windows are glass panel partition which separates a closet area. A minimalist industrial loft-style inspired bedroom featuring a gray concrete accent wall creating a calm and enveloping ambience. White painted brick wall, Edison pendant lights and custom made wood accent wall which doubles as a stylish headboard creates an industrial loft style bedroom. The large wooden framed mirror displayed along the floor help reflects the light and makes the room seem larger. 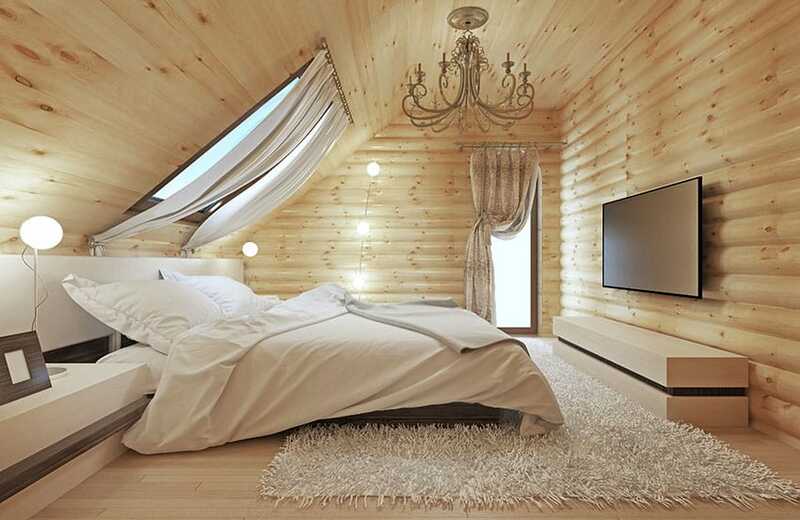 Loft bedroom ideas with all wood walls don’t have to be boring. 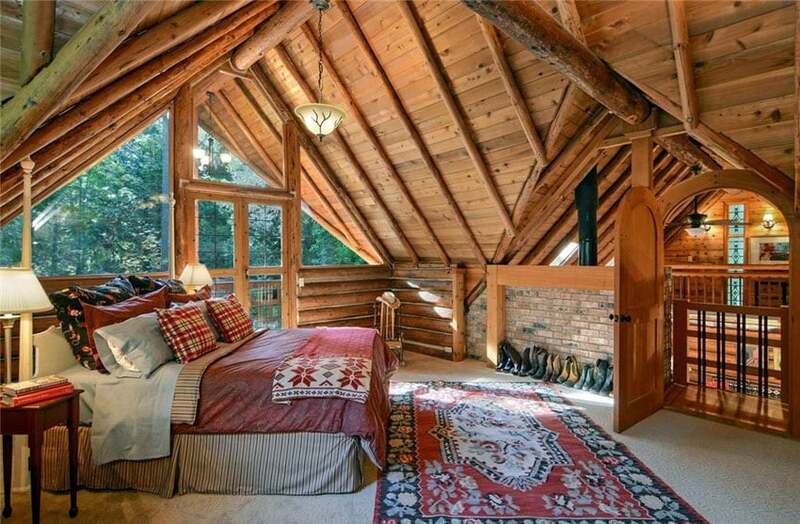 This mountain style inspired wood walled loft bedroom takes advantage of the peaked roof line and skylight above the bed provides the best view in the house. Fixed glass window allows more natural light to shine through the room. Custom made headboard ledge provides extra storage space as well as the other furniture in the bedroom. Light tone wooden flooring with shaggy area rug adds coziness to the space. Modern accessories, appliances and a candlelight chandelier inspires an eclectic design scheme. 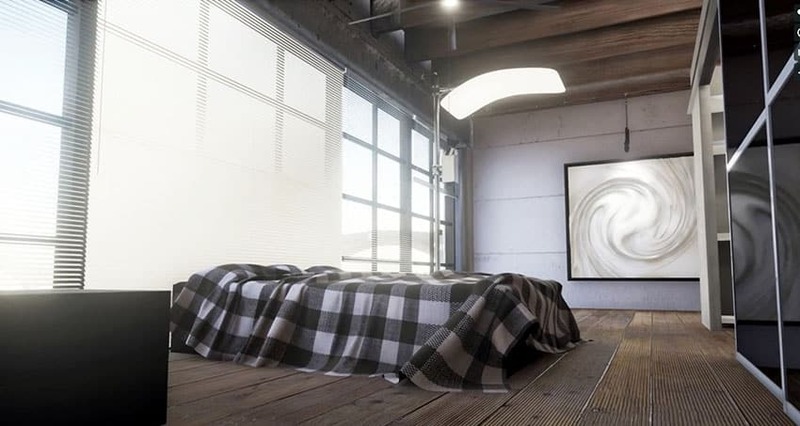 This modern and stylish loft transformed into a masculine master bedroom suite features painted white brick walls, skylight window, trendy wall treatment with fixed shelving for a sleek extra storage space, medium tone wooden floors, contemporary style wooden furniture and accessories. 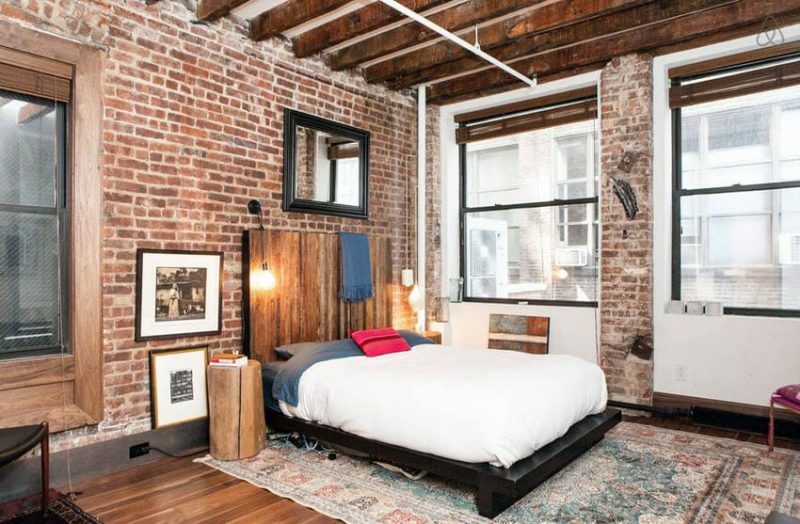 The brick wall of this loft opens to a state of the art master bathroom complete with a shower and bath. An elegant design scheme with a soothing and tranquil ambience.